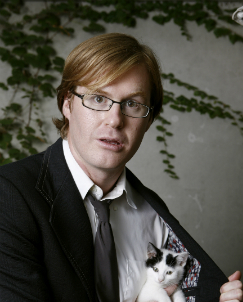 Kurt Braunohler is an “adult” male comedian. In the spring of 2012 he was measured at 6’4”, weighing 214 lbs and tagged with a radio transmitter. Kurt co-created a pilot for Channel 4 in the UK with Kristen Schaal, for their popular web-series, Penelope: Princess of Pets. The duo also have hosted the NYC staple variety show, Hot Tub, for the past 7 years.